I remember hearing about The National playing a one-night show in Manila for the first time. I was out of town and couldn’t get proper network signal. When I finally caught up on it on Twitter, my feed was flooded with ALL-CAPS tweets of excitement, wailing emojis and feelings. Mostly, feelings. February 20 came. The day I got to hug Matt Berninger, sang along to “Vanderlyle Crybaby Geeks,” ugly crying and feeling all feelings. It was a warm hug just being there. And then it was over, but the memory and the feeling, those stay with you for a long time. Why am I telling you this? I know this isn’t one of those American Mary forums. The point of this incredibly sappy introduction is: Meeting your favorite people is a big deal. 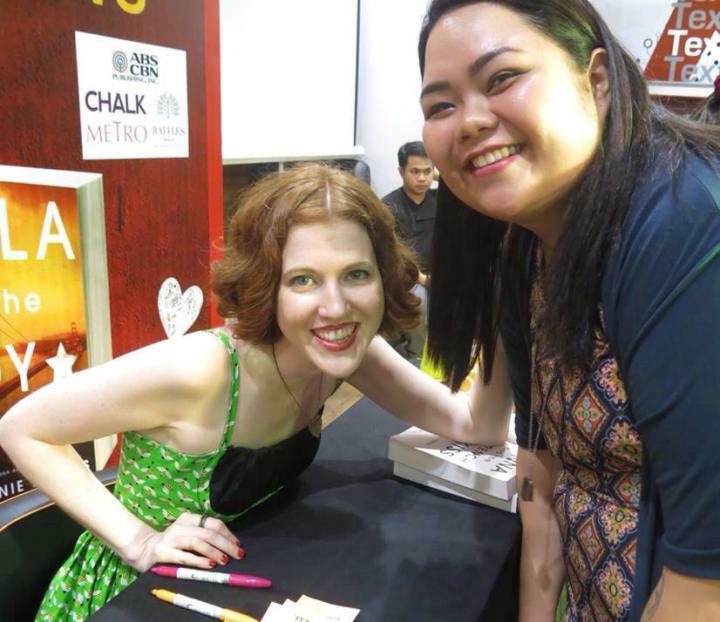 Yesterday (July 6), I attended Stephanie Perkins’ book signing event hosted by the National Bookstore. Her debut novel, Anna and the French Kiss, is one of my favorite young adult novels of all time so you could say that this book signing meant a lot to me. However, I was a bit hesitant to go because I reckoned there will be screaming teens everywhere, and my 25-year-old self will end up out of place. Some people have FOMO (fear of missing out) so they attend shenanigans as often as they can. I, on the other hand, have issues in the participation department. The reasoning center of my brain is almost always operating on fear I sometimes am close to feeling sorry for myself. Which I admit is a great example of totally whacked thinking, you know? Spending hard-earned money and a good chunk of your time on life experiences is extremely rewarding. But I went. Thank God I went. Apparently, I am not a special snowflake; there were plenty of 20, 30, even 40-somethings at the event. Almost all of them were clutching their books that, in about an hour, will be signed by Stephanie Perkins. I even saw a cute couple having a moment! Stephanie Perkins was lovely. She did a brief interview before the signing and answered relevant questions, such as which character from her books was based on her husband (Jarrod volunteered to answer: Cricket) and future projects. She told us the story of how 17-year-old Stephanie Perkins met Jarrod – and how he flew across America to be her prom date, and why writing about young adults is close to her heart. Collective awwws all over the place, I tell you. Stephanie signed more than a thousand books that day. I read that some book signing events only allow one book per person but at Stephanie’s, you were allowed to have at it. It’s also admirable how she didn’t even take breaks between signing. She took time to listen, answer a few questions while signing, and say a few kind words to her Filipino fans. When I told her about Bookbed, she even stopped signing to look me in the eye and tell me it’s a great project and that she’ll look for #readingnation on Twitter! On my way home, I remembered Anna and how her story is more than just stumbling upon a cute boy with awesome hair. It’s about courage. Anna was shipped to boarding school in France where she had to start over, completely on her own. AND SHE GOT OVER IT. Eventually.